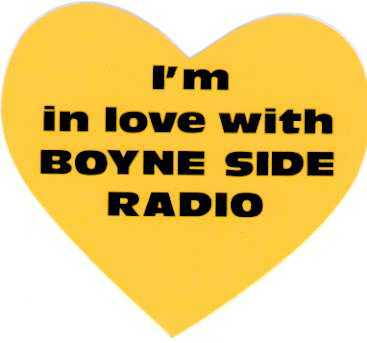 Boyneside Radio from Co. Louth was one of the largest and most successful regional stations in Ireland during the 1980s. It broadcast for 10 years from 1978 to 1988 from Drogheda. During that decade Boyneside developed a series of additional transmitters and opt-out services in Navan, Kells, north Dublin and along the border aiming into Northern Ireland. Here’s a selection of airchecks and promos from 1986-1988, including one seeking a new transmission site in Kells. The end of the 6.02 evening news and ads from 30.08.88. The news began at 6.02 to allow time for the Angelus. Boyneside was one of a small numbers of stations to broadcast the Angelus at 12 noon and 6pm. The opening of the 6.02 news from 30.08.88. The presenter is Áine Ní Dhuibhir (aka Ní Chairbre). Boyneside broadcaster and engineer Eddie Caffrey seeking a new transmission site in Kells, Co. Meath. We have no date for this recording. Top of the hour into news from 1984.